Are you struggling to raise money for your fantastic idea and want to impress potential investors? You may feel lack confidence in completing a pitch deck on your own. Paying an expert may not be the best option all the time. Creating your pitch deck is not hard. All you need is a clear message you want to send your potential investors. A pitch deck is a presentation that entrepreneurs use to show their business idea to partners, investors, and customers. The most commonly used programs in creating pitch decks are Microsoft PowerPoint, Apple Keynote, and Prezi. Ideally, an effective pitch deck does not exceed 20 slides and must be visually appealing. Long and text-concentrated presentations tend to bore audiences. It’s crucial to gain interest in your company by preparing a deck that holds your audiences’ attention. The Problem: You need to communicate to investors that you are worth their time and attention. The core of every business idea is to solve a problem. This is how you will know who your target market is. In this slide, identify the problem that your product or service intends to address. Determine the reason why it is important to bridge that gap. Take some of the ideas you’ve thought about in Easy Tips to get your Product, App & Entrepreneurial Ideas Off the Ground. The Solution: What makes your target market have to have this? Why do they NEED it? What pain points are you alleviating for them? What will compel an investor to put their money with you? This is where you describe your business idea. Will you provide a product or a service? What are the key features? How will customers benefit from it? How will it address the problem that you mentioned on your previous slide? Use related pictures, videos, and include real stories in presenting your idea. The visual presentation is more appealing than long explanations in the text. Your Business Model: Identify how your business idea will become profitable. Identify how your business idea will become profitable. What will you charge your customers? How can you justify your pricing in comparison to your current competitors? How will you and your investors earn profits? Your Target Market: Include demographics and actual statistics. This part of your pitch should explain who your target customer is. Include demographics and actual statistics to show the total market size. Make sure that the data you will present is accurate and specific. Justify that a growing business is possible many will benefit from your product or service. Your Company Background: Sum up the essential details about you, your business, and your organization. The first thing that potential investors, partners, and customers would want to know is who you are. In bullet points, sum up the important details about you, your business and your organization – what products and services do you offer, what is your expertise, where is your headquarters located, how long have you been in the industry and what are your business experiences. Your Mission and Vision: Consider this part as a short elevator pitch. Keep this slide quick and easy to understand. One to two sentences will do. How will you distribute your product? What are your future goals for your company? 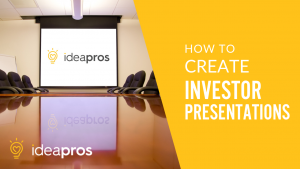 IdeaPros is a Super Venture Partner™ who has the resources, experience, and tools to help you succeed at this step or any step in the entrepreneurial journey. We partner with entrepreneurs at any stage and who are ready to invest in the success of their idea. Apply for an interview and let’s explore partnering together.